One of my New Year’s resolutions (is it too late for resolutions?) is to get better at tracking my daily calories, water, and steps. Do you have any suggestions for the best phone apps to help me out? Almost the entire Hungry Girl staff uses this food journal app, and with good reason! It’s an easy way to track your food intake and all the nutritional information that comes along with it: calories, fat, carbs, etc. Start with a calorie goal, and add your food throughout the day. You can select from a list, create a recipe, or use your camera to scan any product barcode for on-the-go tracking. Save your favorite foods, and create meals for easy adding in the future. Podcasts serve two purposes when it comes to healthy living: They’re great entertainment while you exercise, and they can be packed with lifestyle tips & tricks! 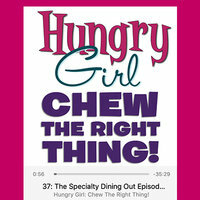 Of course, my top recommendation (shameless plug) is Hungry Girl: Chew the Right Thing! 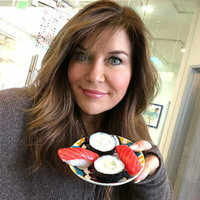 Each food-centric episode is around 30 minutes and tackles a different topic: jump-starting your diet, food swaps, no-cook meal ideas, dining out… There are almost 40 episodes so far, so check ‘em out! I also love The Chalene Show and (although it has NOTHING to do with food or health) Dirty John. I’ve been using this one FOR YEARS. And get this: You don’t even need a Fitbit tracker! 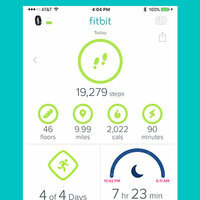 Use the app on its own to track basic activity like steps and water intake. Better yet, sync it with a Fitbit Tracker for a more detailed picture: calories burned, active minutes, and more. Compare data from week to week to see how you’re doing! I love how it stores all your info in one place. This app was recommended by Hungry Girl staffer Katie. Unlike some other tracking apps, this one PAYS you for logging food, water, exercise, and more. You get $10 for every 10,000 points. (Katie made $40 last year… Go, Katie!) If you’re already in the habit of tracking your food or steps, this could be a fun way to make a few extra bucks in the process. Give it a try! Bonus: iPhone Apps & Hacks! Clock: Did you know there’s a bedtime feature that can help you go to sleep on time? GENIUS. 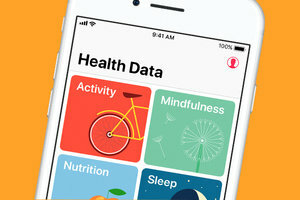 Health: Your phone’s Health app will track your steps as long as you carry it with you… Who knew? Calendar & Reminders: Schedule your workouts, and set reminders so you don’t miss one. You can even use reminders to prompt you to stand up, walk around, or drink some water. Homepage Hack: Visit hungry-girl.com, click on the box with an arrow at the bottom of your phone, and select “Add to Home Screen.” It’s like having a Hungry Girl app, where you can search recipes and view the latest! P.S. 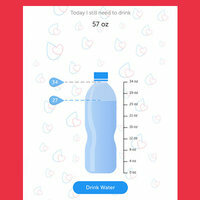 Check out the Hungry Girl Diet COMPANION App! It was developed as a companion to The Hungry Girl Diet. (You need the book to use the app.) 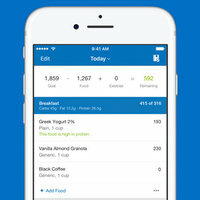 It allows you to track meals & snacks on the diet plan and build shopping lists for ‘em too! Get more info on the book AND the app here. DOs and DON’Ts of Dining Out at Chinese Restaurants, Italian Eateries & More! ⭑ Your best bets for appetizers, entrées… even dessert! Click to listen, and subscribe so you’re the first to get the episodes! As an Amazon Associate, we may receive compensation from some of these links. Ratings are accurate at time of publication and are subject to change. Today’s Happy Chew Year Challenge: Create or share your own 3-ingredient recipe on our Facebook page. Our pick? This 3-ingredient dough! Click “Send to a Friend” to share with someone you know would appreciate this info!